Today was the day for the annual Rotary Duck Race at Alton Baker Park. 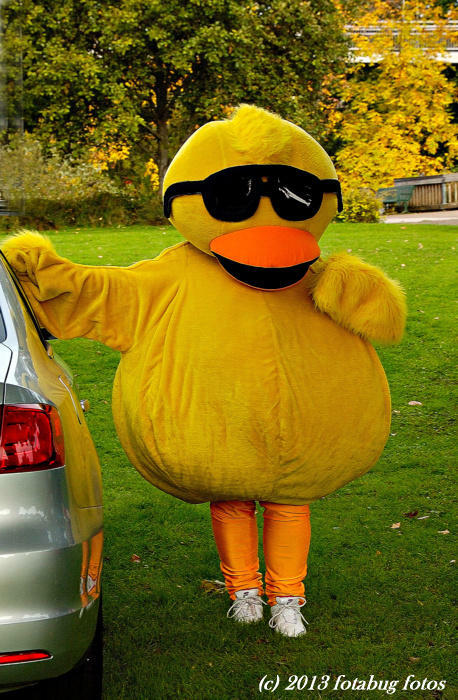 Donors are encouraged to buy a little rubber duck, which is then included in a race from the Frohnmayer Pedestrian and Bike Bridge down the Willamette River to DeFazio Pedestrian and Bike Bridge. The winner would get a new Chevrolet pickup. Here you see a real live rubber ducky, well ok, she was just ducky then. The race supports programs that benefit local children. This one is a winner, cute little duck! That is one cute duck! Big kids with Nikons that is. Looks good standing - In the water is he 'Just Ducky, when swimming? A fun shot, love the trainers.